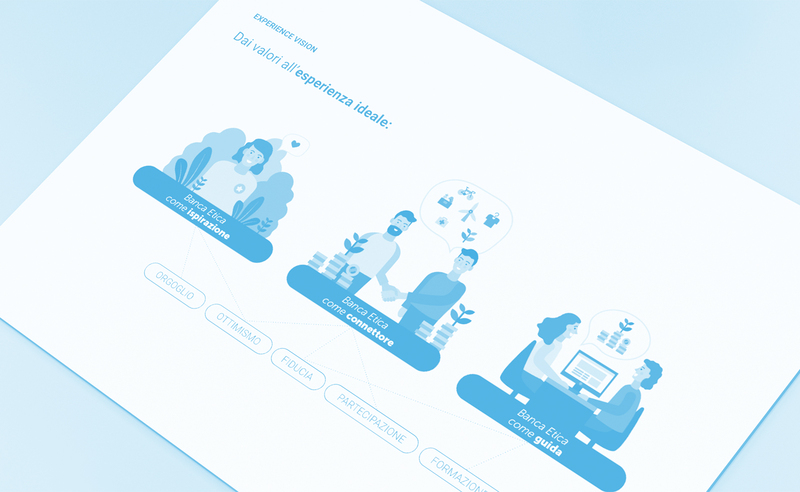 Envisioning a new customer/user experience often requires to identify some guiding principles that can inspire the work of multiple teams inside the organizations. 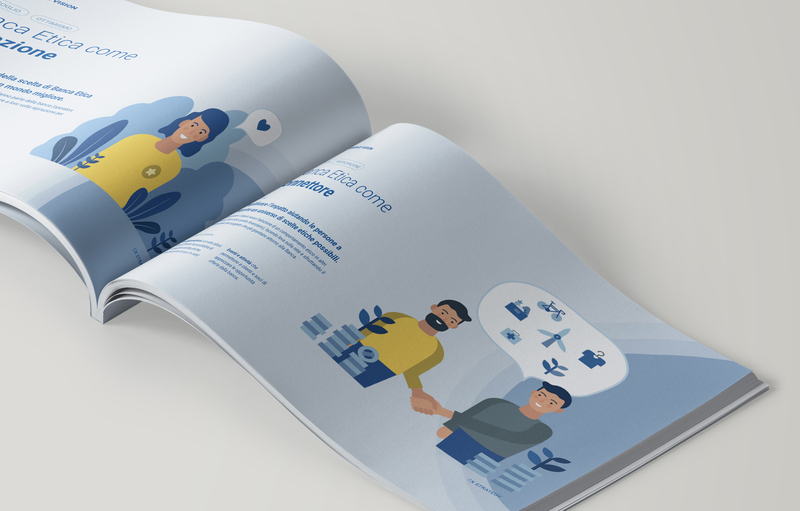 Describing what these guiding principles are and how they shape the relationship between the users and the organization is not easy: text-based descriptions could work, but we always ask ourselves how memorable, tangible and actionable those words would be for their adopters. A possible strategy to augment the narration of experience principles is to combine the textual description (e.g. "transparency") with visual representations that make those abstract concepts more clear and tangible. Visual representations could be icons, pictograms, illustrations, photos or a combination of those. The goal is to produce a visual for each principle, incorporating its key aspects, and so helping understand and remember it. It's very important that those visuals go straight to the point, and are not perceived as generic illustrations with mixed meanings. 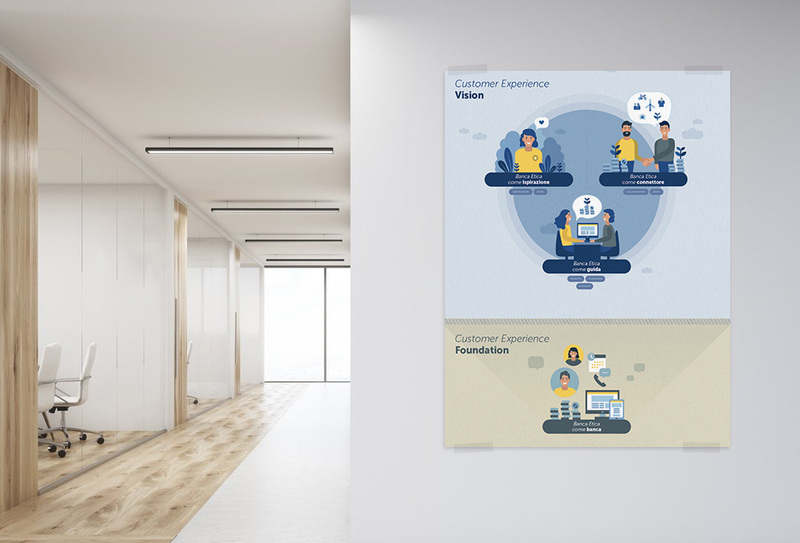 The text and its visual, all together, can be shared inside the organization by displaying the principles on posters, cards or other artifacts. In this way they can be more easily embraced by different departments with different purposes, becoming a clear synthetic representation of the overall strategy and supporting during ideation or co-creation sessions. Besides paper-based educational materials, if would be interesting to explore other ways of bringing the experience principles to life - e.g. combining them with immersive video-scenarios.